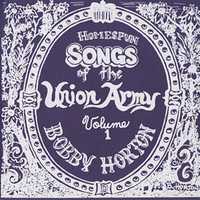 In 1987 I was aware of the interest in all things Confederate, however, I had no idea whether there was a similar interest in music from the Union side in the war. After a discussion with a friend, Bob Housch, I decided to produce a volume of tunes from the men who wore the blue. This first volume has some wonderful songs that were beloved by the civilians and soldiers from the North. Like all my other recordings, I played all the instruments, sang the vocal parts, did the liner notes and cover by hand, and recorded here in my home production studio (on a Fostex 8-track analogue recorder) – hence the "Homespun" in the title. I hope you will enjoy these fine old tunes!